Ergonomically designed ratcheting screwdriver with special thumb grip providing an extra 25% more torque. Supplied with a 1/4" magnetic bit holder, 16 insert bits and six 1/4" square drive sockets. 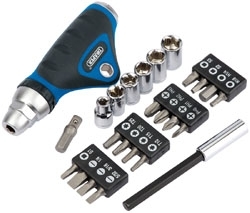 This 25 piece kit is ideally suited for use around the home and workshop.